Family Tree DNA have just announced at their conference the introduction of a new Y-chromosome DNA test to be known as the Big Y. The new test uses next generation sequencing technology which is much more reliable for the Y-chromosome than the chip testing used for the Geno 2.0 test from the Genographic Project and the Chromo 2 test from BritainsDNA. The Big Y is intended as a replacement for the Walk through the Y test which used the slower and much more expensive Sanger sequencing technology. The Big Y test covers 10 million base pairs. It will provide results for almost 25,000 of the known Y-SNPs. However the exciting part is that this test can also be used for SNP discovery, opening up the tantalising possibility of finding SNPs that will prove to be unique to a particular surname lineage or an individual branch of a family tree. The introductory price of the new test is $499 (£311). The selling price from 1st December will be $695 (£434). The test currently only seems to be available to existing customers, but it may that the FTDNA home page hasn't yet been updated. There is now a new splash page on the personal pages of male FTDNA customers. People who have ordered the old Walk through the Y test will receive a voucher giving them an additional $50 off the cost of the new test. The new voucher (coupon) will be available on personal pages from Monday. No doubt further information will be forthcoming in due course from the people who have attended the conference. It has been possible to pick up quite a bit of the news from the conference tweets (search on Twitter using the hashtag #FTDNA2013). Details of all the other currently available SNP tests can be found on the ISOGG Y-SNP testing comparison chart. This will now need to be updated to include details of the new Big Y test. In other news from the conference it would appear that the Genographic Project will be introducing a new Geno test within the next seven to 12 months. It may be that the next Geno test will also use next generation sequencing technology. The ISOGG Y-SNP testing comparison chart in the ISOGG Wiki has now been updated to incorporate details of the new Big Y test. Roberta Estes has advised on her blog that results from the Big Y will be delivered in 10-12 weeks and the results will be accompanied by comparison tools. See her blog post here. Jennifer Zinck has provided a very nice detailed summary of the first day of the FTDNA conference with further information on the talk on next generation sequencing by David Mittelman, FTDNA's new Chief Scientific Officer, in which the new Big Y test was announced. Click here to read Jennifer's blog post. CeCe Moore has blogged briefly about the Big Y test. Most importantly she has received confirmation from David Mittelman of Family Tree DNA that Big Y customers will be able to download their raw data files on request. See my blog post on The Family Tree DNA Conference 2013 for a compilation of all the blog posts and other coverage from the conference. - The Big Y roll out - the SNP tsunami is on its way! I am following the Twitter feed as well. just wondering if the possibilities of finding New SNPs will make this a viable alternative to the Full Y test. There are almost 60 million bases in the full Y chromosome sequence but about half of the Y might never be sequenced because it has lots of impenetrable repetitive regions. The full Y from Full Genomes covers about 27 million bases. The FTDNA test covers about 11 million bases. With the Full Genomes test there's supposed to be one new SNP every 60-90 years. If we extrapolate down from that perhaps we might expect one new SNP every couple of hundred years with the Big Y test as it has less than half the coverage. That would actually work very well for genealogical purposes. However, I'm only guessing and the real test will come when the results start to come through. It's certainly more affordable than the Full Genomes test and I would feel happier having the test done at FTDNA which is an established company with a good infrastructure. I shall be interested to hear what all the haplogroup project admins think. What I would still like to see is a cheap SNP test so that people can just find out which subclade of R1b they belong to. Thanks Debbie.I am seeking feedback from multiple sources and will certainly share whatever I find out. I have been impressed with Full genomes so far aside from their time delays. If they switch to using UCL and/or domestic providers I will be even happier. For $1250 Full Genomes includes 27 million bp coverage, 300 Y-STRs in their test as well as full mtDNA sequence. Full Genomes has the edge IMHO. I hereby dub the new product the bigWHY? Quoted from the product splash screen: "10 Million base-pair coverage - more than any other Y-DNA test on the market." Full Genomes Corp. has sequenced 20 to 25 million base pairs per each sample. My own FGC test had reported calls for slightly over 25 million positions. It has been estimated that about 13-15 million of those are viable, belonging to non-recombining regions. Has FTDNA actually done adequate market research? "For $1250 Full Genomes includes 27 million bp coverage, 300 Y-STRs in their test as well as full mtDNA sequence." That 27 million was misquoted from me, and should have been reported at 25 million. and do they give us the result as raw data and in terms of AGTC for each of these 25,000 positions? and do they give us the result as raw data and in terms of AGTC for each of these 25,000 positions?" Where is the list of the 25K SNPs? Where is the y-2014 tree? I am with Vince on this. When we get past the hype, it seems to me that Full Genomes is offering getting for double the amount of Y-DNA sequence. And it was not clear where the sequencing was done. In-house at FTDNA or out at Illumina. Other questions to add are how long will it take (64k dollar question! ), how long will the analysis take and who has ownership of the SNPs as well as availability of the .bam files. and do we know how many x reads they are doing to compare with the 50x reads at FullG? And does it provide 300-400 STRs too? So more details needed but not that gripped so far. Look forward to Debbie updating the ISOGG Wiki with the side-by-side comparison chart of Full Y-DNA sequencing - and she will need a new bullet point. Happy to work with you, Debbie. I believe that many people will opt for the Big Y based on the fact that it has 20 times the coverage of Walk The Y at a more affordable price, but in the end will still feel the need to test the areas not covered in the FTDNA product. The Full Genomes test on the other hand although twice the price seems to offer the ultimate package currently available. I ordered the Full Genomes test in July but my sample is still waiting to be sent to the lab due to delays in testing, which hopfully are now sorted. I also ordered the Big Y from FTDNA today so eventually should be able to make a judgement on which product I consider the best value. From the impressive FGC results that have been posted so far I suspect that that I will get most satisfaction from the Full Genome product. Does anyone know if FTDNA will use the sample on hand for existing members or if a new kit will be issued? Full Genomes uses a lab in China, probably why it may take so long for results. And I, or one, do not trust my DNA sitting around in a Chinese lab. The chinese firm that does the testing for Full Genome is proven and have very good reputation. From what I understand FTDNA will be able to use existing samples for the Big Y.
I hope FTDNA will provide some FAQs about the Big Y in due course. I would also like to see the list of the 25,000 Y-SNPs. It seems that we will have to wait for publication of the long-promised Genographic Paper. Luckily there are now quite a few people in the genetic genealogy community who have ordered some combination of WTY, Full Genomes, Big Y, Chromo 2 and Geno 2.0. I know of one person who’s ordered all five tests. We should have some good comparative data in due course on Next Generation Sequencing vs. Sanger Sequencing and NGS vs chip genotyping. The comparative tests will enable the citizen scientists to sort out the equivalent names for all the new SNPs that are being discovered. There are no STRs included in the Big Y test as far as I’m aware. However, the STRs and mtDNA results at Full Genomes are not really so helpful because they have no matching database. FTDNA dominate the Y-STR market and have the world’s largest full mitochondrial sequence database in the world. 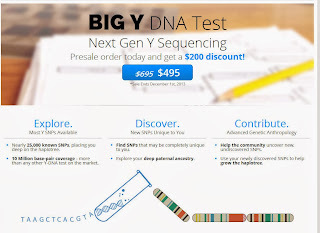 Based on what Magoon is saying, George Jones notes that some customers may consider this statement on a FTDNA website as somewhat misleading or advertising puffery concerning the new FTDNA “Big Y” test: “10 million base-pair coverage – more than any other Y-DNA test on the market.” Such statements should be investigated by a regulatory government body or consumer affairs group … and IMHO, that also goes for other claims being made in the DTC Genetic Genealogy Testing Marketplace. ISOGG has not the horsepower to do this and censor such companies ... so lets bring in the government if these DTC DNA companies are not going to police themselves. As others have not on this blog, comparing a regular priced $695 FTDNA Big Y test to a $1000 or so FGC test is not a pure apples to apples comparison as FGC provides far greater greater chrY coverage as Magoon says, 400+ STR reads, mtDNA test, analysis, raw results etc. All these DTC DNA tests without some sound analysis to customers having varying levels of Genetic Genealogy expertise is not a good game plan. As the Blog author at dna-explained.com notes, neither the Full Genome test not the FTDNA Big Y test is for beginning Genetic Genealogists. We should ask FTDNA Management to fully justify the above noted “Big Y” advertising claim and then report back here our findings. Debbie ... I think you could do that. Guys, this is a highly technical field. Are there any real bio-chemists or genetecists blogging here? We are diving deep into the woods on a technical field. We need real technicians to answer. The only thing that is relevant to many of us is to find distant relatives and to assemble our true family tree going back for as long as we can. FTDNA has thousands and thousands of customers and builds test for the mass market and tries to integrate the results into their family surname and deep clade project system so people can share information and learn more about what they care about. Coverage of the Y chromosome must obviously be a good thing. Low prices must be a good thing, but we have to ask ourselves what the value is for us. Just because one can scan the ocean of the Y chromosome doesn't mean we are going to find a lot of gold nuggets floating on the ocean. That's why pure coverage is not the holy grail. Another non-technician's comment - BigY offers 60-80% of FGC's viable SNP coverage at a current offer price 40% of FGCs. This seems to be excellent value for money. The significantly lower price important as we need to encourage many people to test in order to place the new SNPs in the phylogenetic tree. Good news Debbie. Because the end of year sale started, I ordered a Y-DNA test for my cousin. Also FF. When I did that, there was a coupon for $10 on another order if I uploaded a GEDCOM for my cousin. I did so. Then the website then offered me a Big Y test and I applied the coupon to Big Y. 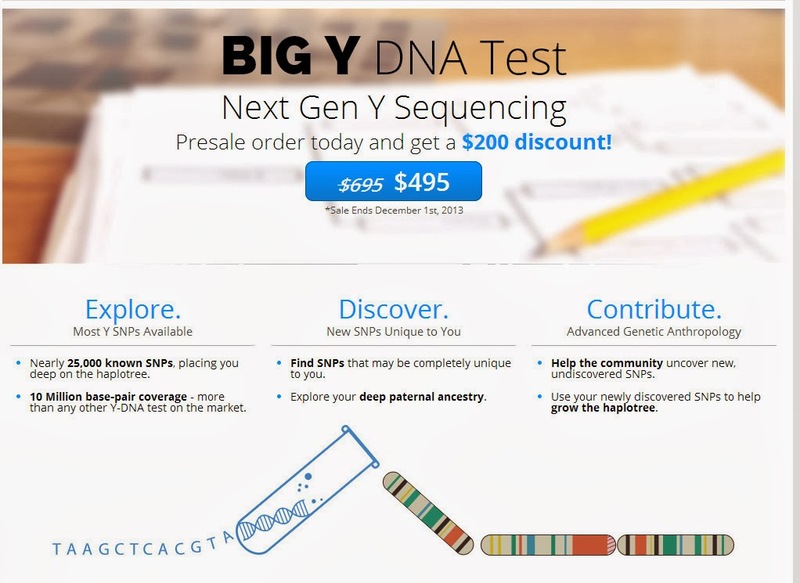 So - if you order a Y-DNA test as a "new" customer, you should also be able to order Big Y.
SB, Thank you for letting us know that it is possible for new customers to order the Big Y test once they've ordered another product. The Big Y and the Full Genomes test are really only for advanced users at this time. Dose this require a new swabs? or what ? I understand that FTDNA will be able to use the stored samples so you will not have to do another swab. I did an analysis ydna-67 in a family-historic goal. What is the usefulness of this new analysis ??? The project admins will be able to advise you on additional testing. In case anyone is wondering about the Big Y Test release of results today…..it has been very disappointing for pretty much all involved as test results were not delivered as promised today (and a fourth date of "hopeful" release was passed along to customers of the Big Y Test from Nov/Dec 2013..
To find out that the on 28 Feb 2014 that the expected date (which was changed three times to 28 Feb 2014) of 28 Feb 2014 will not be met, however it may are may not be met by 28 March 2014 (even if there are no issues above FTDNA having to process the test) is pretty horrible customer service. Agree with Peter MacDonald. It all taste like a sale trick with "good" results released first, before the real statistics from BigY shows. FTDNA does not answer any questions about how many kits that is actually processed, done and ready. Asking to much questions in their own forum leads to a moderator sending private message and threats to ban you from the forum. Standard FTDNA procedure. When customers is dissatisfied and complain: question them, or threat them. Customer support 101. "We are also hearing the frustrations from those who have not yet received their results, and we would like to address the matter publicly in the form of a sincere apology. The entire FTDNA team has been working very hard over the last few months with high determination and many late nights. Launching a new product is always a challenge with many moving parts, some more predictable than others. Unfortunately we ran into some surprises beyond our control when one of our suppliers ran out of certain reagents we needed for running the Big Y product. However we recognize that it is our responsibility and duty to meet our deadlines and keep our customers informed when problems arise." SmallY, I think the e-mail from Nir Leibovich should answer most of your questions. It is not a question of "good results" being released. There is only so much that can be released in one go. This is a trailblazing new product, so we are bound to have a few hiccups along the way. There have been delays with all the new tests in the last year or so (Geno 2.0, Full Genomes, Chromo 2). You just need to be patient. Why does FTDNA anawer the simple question about how many BigY results they have at their hands then? I beleive there are more than a thousand, but only 100 customers have got theirs. Coclusion: the 100 is handpicked in close cooperation with the sale department. The official statement says nothing if they cant be honest about the actual number of BigY test that is already processed. It is so simple to answer but yet they ignore the question and does not comment it, at all. They treat to ban you from their forum instead of being honest to their customers. That tells a whole lot about FTDNA. Small-Y, You are seeing conspiracies where they don't exist. Results are being released on a first come first served basis. The results that have been processed and have gone through quality control have now been released. Other results will be released in stages when they are ready. There was a glitch with the FTDNA website on Friday and I imagine the priority was to get that sorted out first. It is now the weekend so I wouldn't expect to see any more results arriving until next week. The results are what they are. They are very diverse and are not in any way cherry-picked. 1. Does FTDNA currently have enough of the reagent in their current possession to complete the remain of all Big Y Tests? 2. What is the planned scheduled release of each testing group leading up to the expected completion of Big Y Testing. Hope fully FTDNA will push out this information to its Big Y customers soon. Not receiving notification with updated release test results requires individuals to check in to confirm any changes, resulting in wasted time. I'm afraid I don't know the answers to your questions. FTDNA are hoping to deliver all the results by 28th March so I assume they have enough reagents to complete the process. You won't need to keep logging in every day because you should receive a notification e-mail to tell you that your results are in. The results are being delivered in batches and I know that more results were released yesterday. The material on these pages is copyright Debbie Kennett or reproduced with permission from other copyright owners. It may be downloaded and printed for personal reference, but not otherwise copied, altered in any way or transmitted to others (unless explicitly stated otherwise) without the written permission of Debbie Kennett. © Debbie Kennett 2007-2017. Picture Window theme. Theme images by A330Pilot. Powered by Blogger.